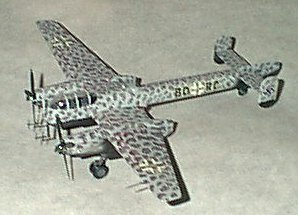 The Arado AR-240 was designed to meet the same mission as the Messerschmidt 210/410 series, that of a fast attack bomber/heavy fighter/destroyer. The initial design of the AR-240 was that of a much shorter aircraft, with the cockpit set farther back. This design proved to be unstable in every axis, basically rendering it unsafe to fly. A redesign pushed the cockpit into the nose, similar to the ME-210/410 and HE-219. 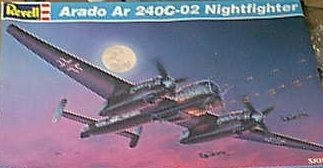 The AR-240 prototypes were often re-engined, to test new configurations. The prototypes were flying in 1941, but various delays kept the aircraft from production until 1942, when it was cancelled by the German government. 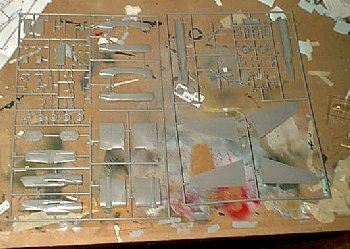 The kit itself goes together relatively quickly.There are two sprues of light grey pieces, and one of clear parts. They seem to be moulded well, with fine recessed detail on the various surfaces. No flash or short shots were on my copy. The cockpit, despite all of the glass area in front and above it, is not very detailed - some sidewall detail is present, though is somewhat vague, and all of the "assembly" you do consists of two seats, a control stick, and the control for the rear turrets going onto the cockpit floor. The instrument panel is provided as a decal to go onto a horseshoe shaped bit of plastic, with vague placement instructions. Given the decking between the seats, the small scale, and the shape of the cockpit, this shouldn't really prove to be an issue. The kit goes together very quickly, and suprisingly easily - I finished assembly in a few sessions throughout the day. The only problematic area is the assembly of the engine nacelles - a good deal of putty was needed on them, and on their join to the wing. A little bit of putty was also needed on the underside of the fuselage as well. 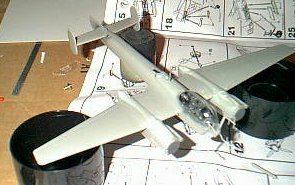 The clear parts and "small bits" such as radar aerials were added, and we were ready to paint. I could not find any pictures of the C-02 prototype, though the codes given on the instruction sheet are correct for the aircraft. I went along with the instruction sheet's suggestion for painting - black undersides, with a grey/light blue upper surface. I mottled the surface by hand, after airbrushing the basic colors of RLM 76 and black. I'm not sure if it's easier by hand or not- it took a lot of time with a somewhat small brush to finish, but at this scale, you need a fine tip and very steady hand with an airbrush. I'm happy with the result. Since this is a model of a prototype aircraft, I didn't weather it. The decals in my sample were accurate - the codes are correct for the c-02 prototype - but had yellowed badly. This didn't really matter much - on the light blue surface, it helps them stand out a bit more! If yours are yellowed, typically leaving them taped to a window that gets direct sunlight will help, though they'll be fragile after a few days. The decals went on OK, but were a bit stiff. I used MicroSol on them to help them settle in a bit. 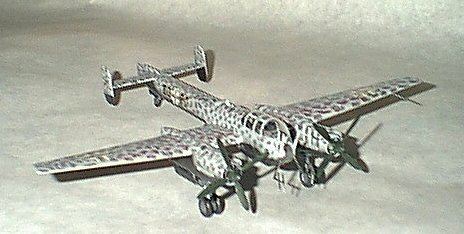 Since this is a Revell-Germany kit, no swastikas were included. 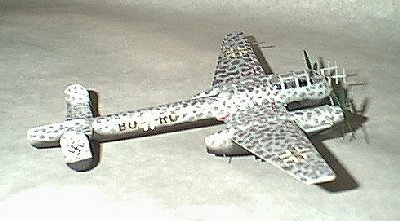 I used some off of Aeromaster's 1/48 sheet - the swastikas were actually quite large on the tail. The finished product looks good to me, and was a quick project. It captures the 240's look of an oversize dragonfly quite well, to me. I was satisfied, though I wouldn't mind if this were a 1/48 kit (one is available, but as I recall, is in resin and is much more expensive.) Just about anyone who can deal with some of the smaller parts should be happy building this kit.